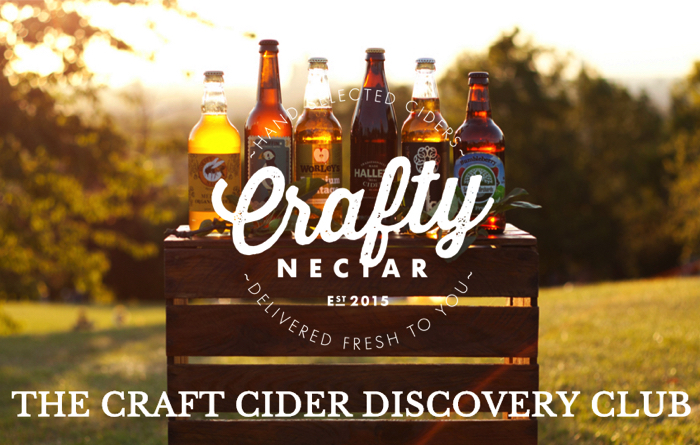 Meet Crafty Nectar….the UK’s first craft cider subscription company. Crafty Nectar, a London based startup, today announced the launch of www.craftynectar.com a monthly subscription company that is tapping into the craft cider revolution, giving cider lovers access to unique, artisan ciders, from across the UK. They deliver craft ciders straight to your desk or door. Over the last few years craft beers exploded in popularity. Today, the same thing is happening with cider. Forget the ‘craft beer movement’ the craft cider revolution has arrived. No longer just for old men with large sideburns, it’s a drink that is fresh, vibrant and full of complex flavours – much like wine. Despite the drop in on-trade commercial ciders, growth in 2015 of the premium, craft cider market is strong, with the category worth almost £729m as consumers are looking beyond mainstream ciders. It’s clear that people are bored of the tasteless and faceless mass market cider brands and have a growing desire to experience cider unlike anything you find in supermarkets or mainstream pubs. However, it’s not easy to get your hands on real craft cider, which is where Crafty Nectar provides a solution. Crafty Nectar connects consumers with producers and gives UK craft cider the national platform it deserves. They make it easy for small batch producers who traditionally sell only to local pubs and farm shops, to reach a far wider audience, allowing customers to discover unique, interesting, and hard to find craft ciders from the comfort of their homes. Did you know Strongbow doesn’t have enough apple content to be a real cider? According to the organisation CAMRA (The Campaign For Real Ale) most mass produced ciders such as Strongbow and Magners don’t have enough fruit juice to class as a real cider. However, research indicates that consumers are increasingly motivated by premium craft ciders – seeking new experiences and better quality ciders. This means that small-batch and local ciders are gaining traction in the market. Even major brands like Heineken are now experimenting with more traditional styles with the launch of their Blind Pig Craft Cider. Crafty Nectar are capturing the growth and enthusiasm for cider in the traditional and premium cider market. All Crafty Nectar’s expert selected ciders are made in the traditional way with the finest apples: with no artificial ingredients or flavourings in our bottles. Every box contains 6 different ciders in 500ml bottles and many have won regional, national and even international awards such as delicious International Gold Award winning Apple County Dabinett. Since launching in November, Crafty Nectar already has an online community of 27,000 cider lovers – enough to fill Lord’s Cricket Ground. NotOnTheHighStreet has recently partnered with the company to fill a ‘gap in the market’ and meet the demand for cider gift products on their site. CEO Ed Calvert is now in talks with investors and is setting out to raise a Seed Round for further expansion this Spring. How do you like them apples? Crafty Nectar was founded in November 2015 by Ed Calvert, a young entrepreneur from Dorset. He is backed by advisors James Waddington (Vizified) and Tony McWilliam (Faction Skis).